Self reflection, reflective practice, being a reflective practitioner and writing reflectively…. Reflection has recently taken on a whole new importance since we as registered paramedics, now have to prove that we are continuing to develop to keep our registration current and up to date. The usual routes for this are internal and external courses that we can access for the all important CPD (continuing professional development) points, but we can also show that we have learned and developed through the use of reflective practice. Ultimately this blog is one huge reflective log for me, and I have put some of the posts that I have published into my CPD portfolio to show that I reflectively and critically evaluate my practice and how I can better myself and the care for my patients. I always reflect. I always have and I always will do. Sometimes I may do it too much and think too deeply about certain people, jobs and situations I have been exposed too, but usually, it’s a very productive thing for me to do, and something that has now found a beneficial outlet in Medic 999. I was driving home tonight, thinking about stuff to write, when I remembered a patient I had a couple of weeks ago. I recall thinking at the time that I would share my thoughts on the job and the patient, because there was a learning point in the encounter, or rather, a thought which reaffirmed a belief which can be eroded with time….. I was sent to a patient, Helen, who was a 65 year old female you had a pain in her knee. It had been a particularly busy day shift for me on the car, and I couldnt help but let out an exaspareted sigh when it came up on the computer terminal in the car. However, I dutifully headed off on lights and sirens as It hadnt been fully triaged yet, and therefore we treat it as a ‘B’ response until we hear otherwise. After about 5 minutes of driving, the radio in the car is activated and control tell me to stand down as the call has been passed on to the GP service for phone advice and a potential home visit. Great Stuff…our control system appeared to be proving beneficial yet again. I was returned to base and very nearly actually got there before I got sent on a further emergency call, so off I headed again. I continued through my shift until about 1 hour away from finishing time. The console in the car lights up and the familiar siren noise quickly draws my attention to the screen. I look down to see a familiar address, its Helen, the lady with the painful knee again. Control inform me that she has called back and this time I am going to have to travel, but as a category C response (no lights or sirens). This is likely to give me a late finish which causes me to grumble my way to the house. By the time I get there, I am ready to tell her to wait for the doctors visit as already planned and then I can be on my merry way again. However, what I have learned over the years is that no matter how frustrated I am, the patient, their family, or carers must never know about it. I class myself as a professional care provider, and I feel it is essential to always give off that air of professionalism, therefore I walk into the house with a happy “Hello Ambulance!” and a smile on my face. After 5 minutes with Helen, I feel ashamed of my preconceptions. Granted she is in no need of immediate life saving interventions or even any paramedic interventions of any sort. She is however in need of support, kind words and someone to listen to her and take her concerns seriously without feeling that she is getting fobbed off by the health service. She tells me that she has rang back as the GP had contacted her and just told her to take some extra painkillers and see how she goes on. She states that the pain isnt unbearable, but it is limiting what she can do. She struggles to get out of her chair and it hurts her to walk more than a few paces. She is already at the limit of what she can take of her current analgesia and is ‘clock watching’ to wait for her next dose. She is a lovely women, kind eyes and softly spoken. She tells me that she feels as though no-one is taking any notice of her. Her painkillers are just not working anymore. There is a history of a fall 6 weeks ago, which she received a hospital assessment for at the time, but they found no evidence of significant injury, but she has never felt back to normal since then. Her physical examination is unremarkable, with nothing obvious to account for her continued discomfort. After I have finished her assessment, I tell her that I will arrange for an ambulance to come down to take her up to the hospital to be checked over again, and hopefully they will be able to change her analgesia to make her more comfortable, and probably take another X-ray to ensure that nothing was overlooked first time round. I inform her that it isnt an emergency however, and it may take upto an hour for the ambulance to arrive, but she is more than happy with the arrangement. I complete my paperwork and leave it for the crew, then I say my goodbyes and head back to the car, and onto the next detail. Looking back and reflecting on this job (see…magic buzzword!! ), it makes me think that there are many patients that we may disregard on the way to the job, the time wasters, the attention seekers, the inappropriate callers, who actually have just got to the point that they have no where left to turn, and whilst in the vast majority of these cases, there is nothing that we can directly do to help them with their chronic problem (that has now become too much for them to handle), we can still show them compassion. We can still listen to them, and I mean really listen, not just nodding your head whilst writing down their history. And even if the only thing we can do is cart them off to the hospital, at least they will feel as though the ambulance service has helped in some small way. Then there are the other ones, who really do just take the…………………………. « Hello to some new friends! Good reflective points. The paradigm shift is upon us all…to be judicious, proactive, prehospital emergency care practitioners. Couldn’t agree more. I have got into the habit of asking myself three questions at the end of every job. 1. What did I do well? 2. If I was to do the job again, would I do anything differently?, and 3. Is there any gaps in my knowledge that I need to research? My spin…paramedics are prehospital generalists in that we need to know a little about everything. Enjoy your blog..keep up the good work. How lovely would it be if more paramedics would adopt such an attitude? I really get demotivated working with colleagues that see every patient that is not potentially going to die within the next hour as ‘timewasters’. It sounds cheesy, but it’s the patients emergency we are going to, not ours. We aren’t getting paid to whinge and moan (if we did we would get paid more, because we do it so well!). The shift goes by quicker if you have a good time with your patient, and it makes me sleep better at night. Keep up the work 999, keeps me going too. Great post Mark. A good part of being a good medic is loving what you do. We’re privledged to work in EMS. We’re privledged to be able to take care of people in their time of need. Reflection is key to improvement. Loving it is key to proper reflection. 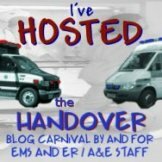 Can’t wait to see everyone’s posts for the Handover! Remember I am not of the medical field, just living vicarious through you….So, as I read, the thought occurs to me that it is not just the medical field that this happens. I work for a plumbing company. Never ceases to amaze me the people that call JUST to have someone stop by for the LITTLEST thing. Or just to call the office, with the guise of asking a question JUST to have someone to talk wtih.. Reminds me to take the time.